By 1900 the Russian Imperial Navy had adopted balloons to enhance scouting of enemy vessels. In the aftermath of Russia’s defeat in the Russo–Japanese War of 1904–1905, during which its Pacific and Baltic Fleets had been virtually annihilated, Grand Duke Alexander Mikhailovich, an admiral in the navy and cousin to Tsar Nicholas II, saw aircraft as a means of rebuilding Russian naval power. Impressed by Louis Blériot’s cross-Channel flight, Alexander reallocated funds that had been raised for building warships during the Russo–Japanese War to purchase airplanes from France, to train Russian pilots, and to build a naval air school in the Crimea. By 1912, the Russian Navy had organized air services for its Baltic and Black Sea Fleets. 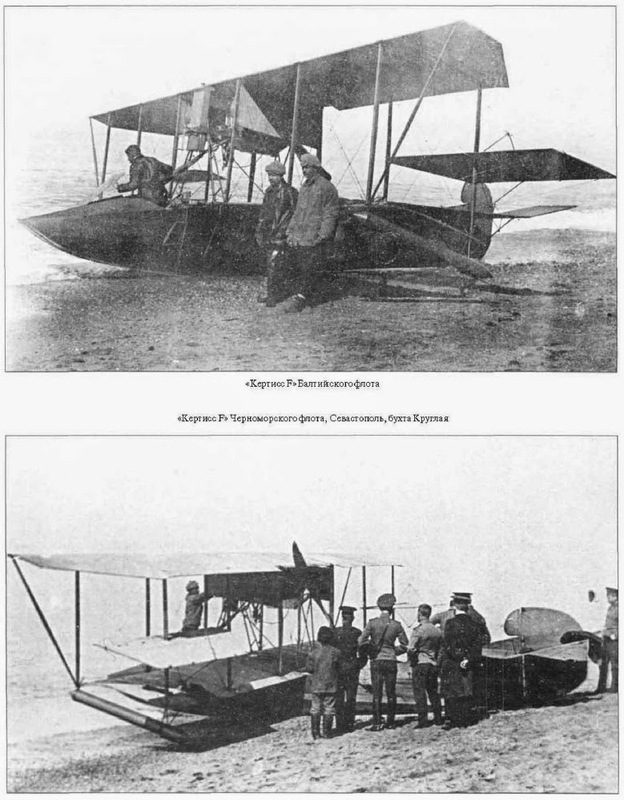 By the time the war broke out in 1914, the Russians possessed a small number of Sikorsky S-10 Hydro floatplanes, which had entered service with the Baltic Fleet in the summer of 1913. The S-10 Hydro was based on a land-based racing prototype, but it had a slightly larger wingspan of 44 ft 11.3 in. (the top wing was approximately 16 ft longer than the bottom wing), a length of 26 ft 3 in., and a loaded weight of 2,381 lbs. Its 100 hp Argus inline motor could produce a maximum speed of 62 mph. They were used primarily for unarmed reconnaissance in the Baltic. Only sixteen were produced because the Russko-Baltiisky Vagonny Zaved placed a heavier priority on producing the Sikorsky Ilya Muromets. Even though Sikorsky had developed only one seaplane that entered production, one of his leading rivals, Dimitry Pavlovich Grigorovich, would build a series of flying boats while serving as chief engineer of the Shchetinin works in St. Petersburg. 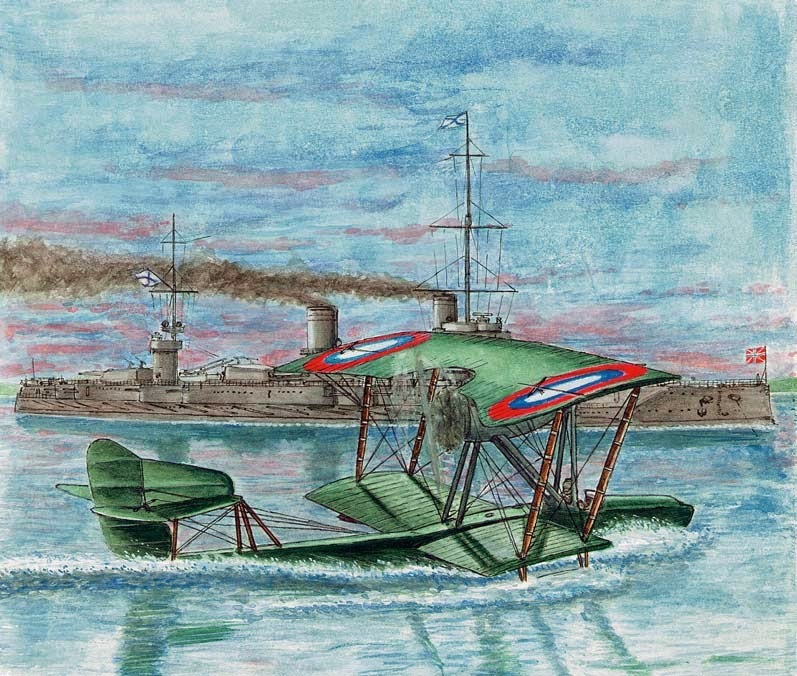 At first Shchetinin produced licensed-built Farman and Nieuport aircraft, but after making repairs to a Donnet-Leveque Type A flying boat, Grigorovich designed a version of his own that closely resembled it. After the Grigorovich M.5 flying boat was introduced in the spring of 1915, production moved beyond the prototype stage with approximately 100 M.5s being constructed. The M.5 had a wingspan of 44 ft 8 in., a length of 28 ft 3.25 in., and a loaded weight of 2,116 lbs. Powered by either a 100 hp Clerget rotary engine or 100 hp Gnôme Monosoupape rotary engine set in a pusher configuration, the M.5 could reach a maximum speed of 65 mph and climb to a service ceiling of 3,300 m (10,826 ft). It had an endurance of 4 hours. The observer sat in the front cockpit in the nose of the hull and operated a free-firing machine gun (various types were used). Small bombs were also carried onboard. It was used primarily with the Russian Black Sea Fleet, operating out of Russian coastal bases or from Russian seaplane carriers, the hydrocruisers Imperator Nikolai I and Imperator Alexandr I, both of which could carry six to eight M.5s. Its slow speed made in vulnerable to enemy fighters, ultimately forcing it to be reallocated for service as a trainer. It would continue in this latter role until 1925. 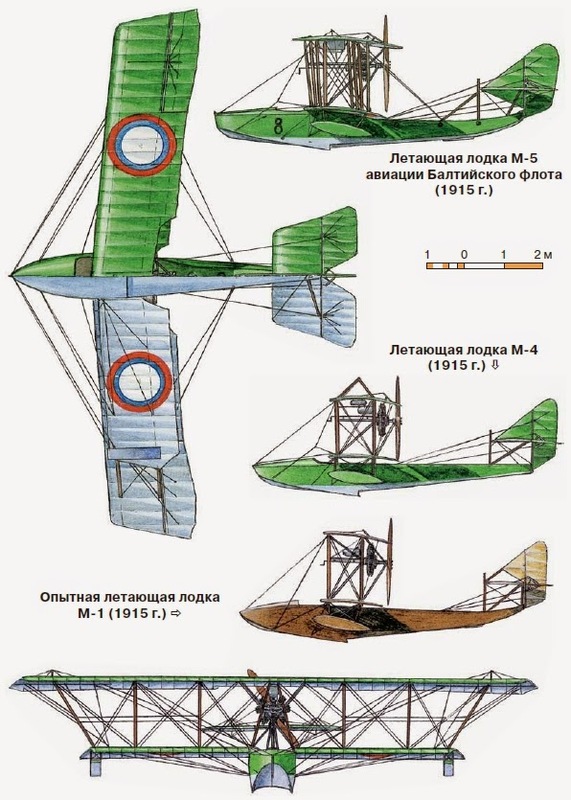 Introduced in early 1916, the M.9 was by far the most successful of Grigorovich’s flying boats, with approximately 500 produced. With a wingspan of 52 ft 6 in., a length of 29 ft 6.25 in., and a loaded weight of 3,395 lbs, the M.9 was larger and heavier than the M.5. Because of Russia’s chronic shortage of engines, a variety were used on the M.9. The most common was the 150 hp Salmson Canton-Unné radial motor, which was set in a pusher configuration. Although it could reach a maximum speed of just 68 mph and it had a service ceiling of just 3,000 m (9,843 ft), the M.9 was extremely seaworthy and proved to be highly effective for reconnaissance, patrolling, and light bombing duties. It saw service in both the Baltic Sea and the Black Sea, either operating from naval bases or from seaplane carriers. Although designed for a three-man crew, it normally carried just a pilot and one observer. It was protected with a pivot-mounted machine gun (a great variety were used) in the nose compartment, and it also carried small bombs. After the war, the M.9 was used effectively by the Red Army along the Volga during the Russian Civil War. In 1917 Grigorovich introduced the M.11, which proved to be his last flying boat to be produced in great numbers. With a wingspan of 28 ft 8.4 in., a length of 24 ft 11 in., and a loaded weight of 2,041 lbs, the M.11 also provided some armor protection around the hull. Its 110 hp Le Rhône rotary engine, which was set in a pusher configuration, provided a maximum speed of 92 mph and an endurance of 2 hours 40 minutes. It would see service with both the Baltic Sea Fleet and the Black Sea Fleet. In addition, a few were modified with skis for use on frozen lakes. Approximately 75 were produced before the Russian Revolution disrupted production. An upgraded version of the F.B.A Type C flying boat, powered by a 130 hp Clerget 9B rotary motor, entered production in early 1916. Most of these were sold to Italy and Russia. This entry was posted in Aircraft, Russia by MSW. Bookmark the permalink.